PlaySmart are often asked by clients how they should clean and maintain their existing safety surfacing. 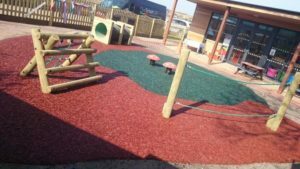 JungleMulch rubber surfacing should always be a low maintenance product after a new install, however, there are things you can do to keep it looking good and extend the lifespan of your playground flooring. Cleaning rubber mulch is a great way to keep it looking fresh and maximise the longevity of the product! As with any surface, we advise clients to inspect them regularly to check for any foreign objects and damage – when addressed quickly, these problems can be put right without growing or becoming more severe. Failure to do so will make it harder to clean the surface and could cost more in the long run in terms of repairs. With our years of experience with surfacing, we can answer most questions about surfacing products and where we can’t, put you in touch with the right people. If when inspecting your mulch you come across a problem you can’t solve yourself, we’re here to help! You can reach our experienced team directly on 01564 742 811. Alternatively, why not take a look at our free guide on how to choose a safety surface? The guide contains more information about how to clean rubber mulch as well our other products. To download, please click the image below.